Start by pre-heating the oven to 350ºF. Then sift all of the dry ingredients together into a large mixing bowl. Take a spatula and gently fold the ingredients together until the ingredients are blended together and uniform in colour. Next, add the vanilla extract, vegetable oil, white vinegar, water, and if you’d like, the maple syrup. Fold these ingredients into the mixture. Using a pastry blender, hand mixer, or stand mixer, blend the ingredients together until it is a uniform consistency and colour. If you are using a stand mixer, careful not to over-blend the ingredients, or the cake will not rise as readily. Mix in the chocolate chips if you are adding them. When the mixture is ready, pour the contents into a greased cake pan. I normally use a standard loaf pan (about 9″ x 4″). To grease the pan, just smear butter around the bottom and up the sides of the pan and lightly dust with a little bit of flour. If you have a non-stick pan, you can skip this step. Place the pan into the oven and set a timer for 45 minutes. The cake is ready when you see the crust has formed and darkened slightly. If in doubt, you can also test the cake by sticking a toothpick or wooden kebab skewer into the centre of the cake. If nothing sticks to the toothpick or skewer, the cake is done. If you’d like to add frosting to the cake, wait for the cake to cool to room temperature before adding the frosting of your choice. A vanilla or chocolate cream cheese frosting tends to go very well with this cake. I also have a vegan chocolate frosting recipe posted for chocolate molten lava cakes I made based on this recipe, which makes a great frosting for this cake. 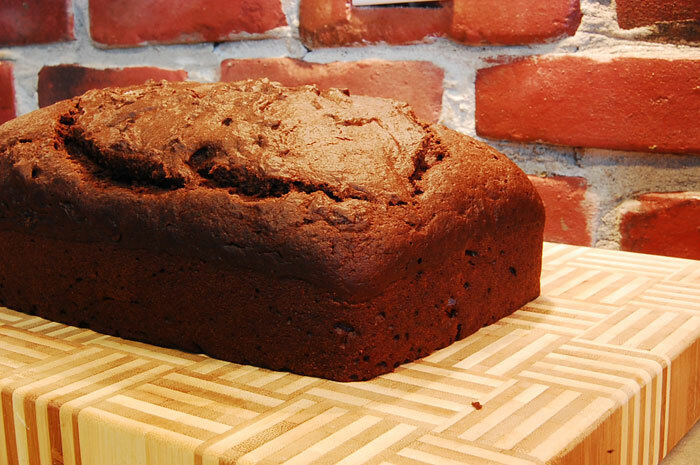 This entry was posted in Desserts, Vegan, Vegetarian and tagged cake, chocolate cake, vegan. Bookmark the permalink.